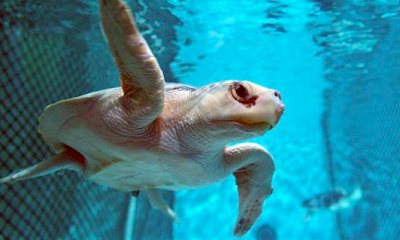 Dozens of cold-stunned sea turtles rescued from beaches along Cape Cod will not be returning to the Gulf of Mexico this summer. After several months of rehab at the Aquarium, they are healthy enough to go home, and they would have been released into the Gulf this summer. Rescued sea turtle being treated at the Aquarium. Click for larger version. The Aquarium's sea turtle rescue room. Click for larger version. That means that visitors still have a chance to see these young Kemp's ridley sea turtles at the Sea Turtle Recovery Room, right here at the Aquarium! Observe how rescue team members and volunteers feed the turtles, or watch them swim around their pens. 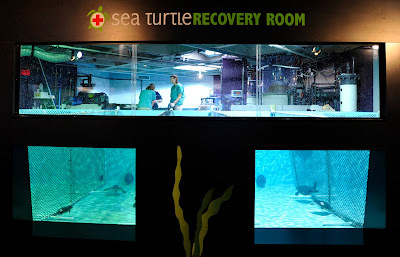 You might even see turtles that are still getting treatment, like #57, who was featured in a recent Rescue Blog entry. Browse around the Marine Animal Rescue Team's blog to learn more about its efforts to save endangered sea turtles and other marine life, like dolphins and seals!